Korea is the perfect place for foodie. There are so many nice foods in Korea. Rice, Soup, Kimchi and all different kinds of side dishes (Banchan) can make your belly full enough. If you are in Korea or if you are planning to visit Korea, Korean BBQ is the perfect food you can go for. I’ve yet to meet someone who doesn’t like Korea BBQ. So I highly recommend you to try Korean BBQ if you have never tried this taste of heaven. What is Korean BBQ then? Korean barbecue (GogiGui, meat roast) is the most popular cuisine in Korea. It reflects Korean Culture. Korean people love to spend time together. They love to eat together, and they love to sing together. Korean BBQ is not for single, solo person but for several people, all together. If you’re going to try Korean BBQ, bring at least three friends or more. The more the merrier. If Korean people say, ‘Let’s go eat GOGI (meat), Korean BBQ’, it means a lot to them. It can mean for dating, for talking, for gathering, for drinking or to relieve stress. Korean BBQ can be a good excuse for drinking and talking with friends, family and even with co-workers. So when family gather they eat Korean BBQ and when they have special occasions in the office, they go to Korean BBQ with drinking after finishing work. Korean BBQ helps to open the conversation especially heart to heart talking. Korean BBQ is grilling meat, typically beef, pork, chicken, or duck but it can also for seafood as well. But it can’t define what Korean BBQ is. Korean BBQ doesn’t mean only for meat or seafood. There are so many other side dishes along with Korean BBQ and that can complete real Korean BBQ. And the way you can eat for Korean BBQ also can define what Korean BBQ is. Korean BBQ usually prepare on gas or charcoal grills built into the dining table. So you can enjoy Korean BBQ at home, at restaurant or even outdoors. You can easily find people who can enjoy grilling Korean BBQ at the park in summer time. Some Korean restaurants don’t have built in grills so they provide customers with portable stoves or Chefs or server can cook and prepare for you. They use central displayed grill for your order. The most popular Korean BBQ is Bulgogi, Galbi and Samgyupsal. Bulgogi usually made from thinly sliced marinated beef sirloin or tenderloin. Galbi made from marinated beef short ribs. Samgyupsal made from pork belly. You can choose between marinated meat and unmarinated meat. You can customize the Korean BBQ so you can change whatever you want. You can pick meat first and then you can pick between marinated meat and unmarinated meat. You can also pick what you are going to put on grill so it can be diverse and unique cuisine depends on your preference. Korean BBQ includes many other kinds of marinated and unmarinated meat dishes and it can be divided into several categories. Some people also enjoy Korean BBQ with Seafood as well. We have several meats for Korean BBQ. It can be beef, pork, chicken, duck and so on. Some restaurants provide all different kinds of meat but majority restaurants in Korea are very specialized in specific meat. Korean restaurants usually provide both marinated meat and unmarinated meat. Regarding Beef, Bulgogi, Galbi and Jumulleok can be the best option for marinated beef. Chadolbagi (thinly sliced brisket point), Deungsim (sirloin), Kkot deungsim (rib eye steak roll), Ansim (Beef tenderloin), Salchisal (chuck flap tail), Galbisal (rib meat), Chaekkeut (strip loin), Buchaesal (top blade), Anchangsal (outside skirt steak), Chimasalyangji (flank steak) can be option for unmarinated beef for Korean BBQ. Korean prefers Korean beef, Korean native cattle and we think Korean beef is the best quality for Korean BBQ. Bulgogi, literally meaning “fire” and “meat,” is classic dish for Korean BBQ. It has been in existence for nearly over a thousand years. It made of thin, marinated slices of beef. Sirloin, rib eye or briskets are frequently used for the dish. It’s sweet, amazingly flavorful and chewy. It’s perfect with scallion salad (PaMuchim) and rice. Caramelized beef with crunchy sweet vegetables can melt your heart. You don’t need any extra sauce for Bulgogi. It’s already marinated with all different kinds of savoy sauce made of soy sauce, sugar, sesame oil, and brown sugar, garlic and Korean pear juice. It’s really simple dish. It’s really easy to cook so you can enjoy Bulgogi at home. I believe it can satisfy even the pickiest eaters. Galbi is sweet, juicy, tender and smoky meat. Galbi is the Korean word for “rib” and the dish is usually made with beef short ribs. Galbi can be marinated in a sweet and savory sauce usually containing soy sauce, garlic and sugar. But also it can be unmarinated for Korean BBQ. You can grill the short ribs over charcoal grill or gas grill. The meat usually cooks for a short time on medium high heat. Galbi cook very quickly, so you should keep watching the grill otherwise it will overcook. After finishing cook, the meat is typically cut into pieces over the grill with kitchen scissors. Galbi is perfect with fresh lettuce, spring onions and kimchi. Like other Korean main dishes, Galbi can be accompanied by rice to make your belly full enough. Jumulleok, Grilled short steak is one of the popular marinated beef for Korean BBQ. Jumulleok is a simply prepared boneless short cut steak that is marinated with sesame oil, garlic, salt and pepper. The cut of Jumulleok would be different from restaurant to restaurant. But the seasoning would be similar. So don’t be afraid to try Jumulleok. Regarding Pork, Dwaeji Bulgogi, and spicy pork Bulgogi can be the best option for marinated pork. Samgyeopsal, also known as pork belly is the most popular option for unmarinated pork for Korean BBQ. Bulgogi is most well-known Korean food along with Kimchi. It has two different types, Beef bulgogi and Spicy pork bulgogi. Dwaeji Bulgogi (Dwaeji means pig in Korean. ), also known as spicy pork bulgogi is slight different from Beef Bulgogi. Beef Bulgogi is traditionally marinated with soy sauce for based sauce. On the other hand, Dwaeji Bulgogi is marinated with gochujang sauce (Red pepper paste), which is a traditional Korean condiment with authentic Korean flavors. Gochujang sauces reduce the pork smell and add extra flavor. Juicy full flavored pork Bulgogi is quite spicy. So I highly recommend you to eat Dwaeji Bulgogi with rice and a lot of vegetables such as lettuce and sesame leaves. Samgyeopsal is one of my favorite dish which is particularly grilled pork belly. Literally, it means three (sam) layered (gyeop) flesh (sal), referring to striations of lean meat and fat in the pork belly, cut with the appearance of having three layers. Samgyeopsal is very popular in Korea. So, there’s a Samgyeopsal Day celebrated every 3rd of March (sam -sam) where all people should eat Samgyeopsal. People usually enjoy Samgyeopsal with Soju or Somaek, a simple cocktail made by dumping a shot of soju into a glass of beer. The meat is usually neither marinated nor seasoned. The flavor from the meat is quite savory on its own, however if you want to try extra taste from Samgyeopsal, you can eat meat with Korean spicy dipping sauce such as Ssamjang which made with chili paste and soy bean paste and Gireumjang which made with sesame oil, salt, and black pepper. I highly recommend that you need to put kimchi and mushrooms to grill when you cook Samgyeopsal together. You can enjoy extra flavors with kimchi, mushrooms and Samgyeopsal all together. I can say Samgyeopsal is well rounded dish for everyone. You can find Ogyeopsal which is similar to Samgyeopsal in Korea. O means “five” in Korean. Ogyeopsal includes the skin part of the pork belly, which is unlike Samgyeopsal where the skin is removed. There is Dakgalbi, barbecued chicken for marinated chicken BBQ. And there is Dakgui for Unmarinated chicken BBQ and OriGui for unmarinated duck BBQ in Korea. Dakgalbi is a delicious, spicy grilled chicken dish. Dakgalbi is a popular choice for friends who are getting together to go out to eat in Korea. It made by chopped chicken with a gochujang based sauce (Red pepper paste), sweet potatoes, cabbage, perilla leaves, scallions, rice cakes and other ingredients. The dish is a local specialty of Chuncheon.You also can prepare this for your own korean bbq event. How do I eat Korean BBQ? You can enjoy Korean BBQ, itself but if you want to enjoy like a real Korean, you should know how to eat Korean BBQ. Like a local. Actually it’s really simple. If you go to restaurant for Korean BBQ, you might get confused what to order because of so many options. You can choose meat first and then you can choose either marinated one or unmarinated one. But don’t worry. Usually, there are a lot of Korean BBQ restaurant offer set menu. You can pick set menu to try all different types of meat for BBQ. I highly recommend you to focus on meat and not order too much other stuff. Because, if you order meat you can get all different kinds of side dishes (Banchan), which is vegetable, Seasoned Soybean Sprouts, mung bean sprouts, kimchi, Steamed eggs, pickled and so on for free. You can eat as much as you want and then you can ask more for free. There will be plenty of food. When you come to Korean BBQ, you’re going to be hit by the smell of meat and smoke, so I recommend you wear casual clothing, However if you wear formal clothing for Korean BBQ, some restaurants will offer apron or Febreze, Air Freshener Products for you. So don’t worry too much. You can use wet towel, or wet tissue for cleaning your hand. Restaurants will offer wet tissue for you. Usually side dishes serve first so you can enjoy side dishes first. Don’t forget to order Soju. Soju is the perfect partner with Korean BBQ. At most Korean BBQ restaurants, a server will come to your table and operate the grill. They set the fire and they cook meat for you in front of you. If servers don’t cook the meat for you, you can cook by yourself. You can hold kitchen scissors one hand and you can hold tongs for other hand. You can put meat and other side dishes such as garlic, kimchi, mushrooms, onions and potato to the grill. You can flip the meat several times and you can tell when is ready for dig in. Please don’t let it burn. If you feel like Grill is too hot you can ask server to control the temperature and you can even ask them to change the grill. Most diners grill the raw meat first because it cooks faster, then move on to marinated meat. If meat is ready, it’s time to wrap the meat with vegetables. The most Korean way of eating Korean BBQ is making a wrap with a vegetable. Korean people call this “Ssam”. You can take one of big vegetable which will be the base for Ssam. 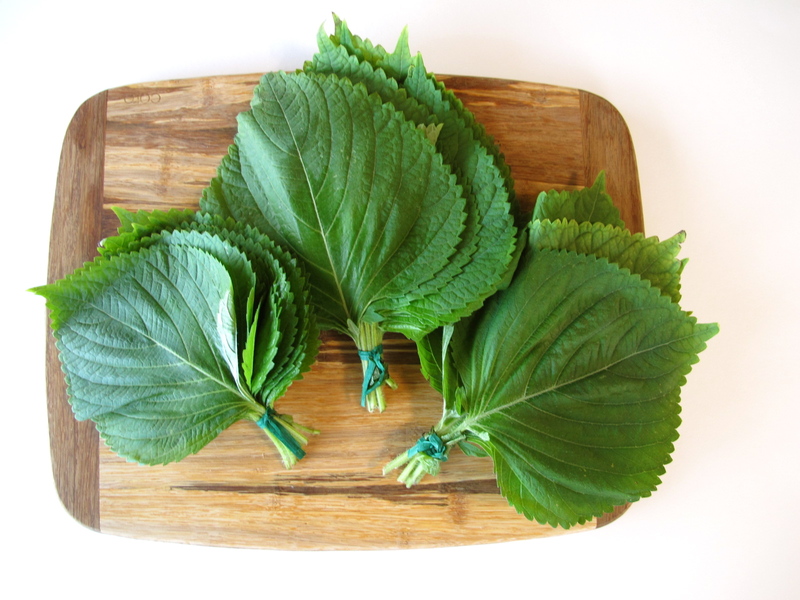 Lettuce and sesame leaf are the most common vegetables for Ssam. On the lettuce, put the meat, garlic, seasoned scallion and other side dishes what you want with a condiment known as Ssamjang, soybean sauce, which has a lot of nice flavor. The sauce, Ssamjang is made of soybean paste, red chili paste, sesame oil, onion, garlic, green onions, and optionally brown sugar. Whatever sauces they give you, you can try all of them. You can customize your own Ssam. And you can share your own Ssam with friends and family. Easy and simple but yummy! After eating Korean BBQ, you might be full or you want try another round for your belly. I hope you don’t miss the second round for Korean BBQ. There are many kinds of after eating Korean BBQ dishes including cold noodle (Naengmyeon), spicy noodle (Bibim Naengmyeon), rice with soup (Jjigae), rice with many toppings (bibimbap), and fried rice (bokkeumbap). These amazing dishes are waiting for your second round. People usually drink Soju for second round as well. After then Korean people usually go to singing room, Karaoke (Noraebang) to digest Korean BBQ. Naengmyeon which is cold noodles in beef broth and Bibim Naengmyeon which is spicy version of it and that’s broth-less. Both are really popular dishes for Koreans especially in the summer time and it goes perfectly with Korean BBQ. After you’ve eaten a lot of meat, you feel like too stuffy and you need something to help you digest and settle your stomach. Naengmyeon is the perfect dishes for your stomach calm down. Mistake 1: They don’t ask to change the Grill Once grill goes black, it’s time to ask to change the grill. So please don’t be shy to ask to change the grill. Mistake 2: They don’t ask for more side dishes. Side dishes are free when you order Korean BBQ so don’t be shy to ask more side dishes. Mistake 3: They let the meat burn. Don’t stress about cooking the meat, at most Korean BBQ places they will do that for you. However, if you need to do by yourself someone’s always have to keep an eye on the meat and flipping it when it’s time to flip. Because Korean BBQ cooks so quickly so the meat is super juicy. Mistake 4: They put too many stuff on lettuce Ssam is not a burrito, so please don’t put too many stuff on lettuce. Otherwise all juicy meat will come out from lettuce. You can eat the meat by itself so you don’t need to make Ssam for every bite. What do we need for your own Korean BBQ at home? All you need is charcoal or gas grill or pan fry also possible, kitchen scissors, tongs, thinly sliced meat (such as raw pork belly or a savory marinated beef called bulgogi), sauces, kimchi , rice and lettuce or radishes for wraps. You will find a lot of different kinds of meat at Korean BBQ, I recommend you pick pork belly or Bulgogi if you are going to do home cook for Korean BBQ. If you don’t eat meat, you can grill mushrooms, potatoes, tofu and eggplant whatever you want can be the best options for you. There are several common sauces with Korean BBQ such as Gochujang, Ssamjang, and Doenjang. But I recommend Ssamjang for home cook. Ssamjang is made of Doenjang, gochujang, sesame oil, onion, garlic, green onions, and optionally brown sugar. You can use sesame oil and sea salt for dipping sauces as well. The most common wrap is a lettuce leaf, perilla leaf but thinly sliced daikon radishes also work great. You can prepare Korean peppers and cucumber as side vegetables as well. (Side dishes) Banchan are small side dishes, and they can be just about anything you want. Traditional banchan are usually pickled or fermented vegetables such as kimchi.